Aciclovir Capsules is used for treating chickenpox (varicella) or shingles (herpes zoster) and treating or suppressing genital herpes infections. It may also be used for other conditions as determined by your doctor. Use Aciclovir as directed by your doctor. Drinking extra fluids while you are taking Aciclovir is recommended. 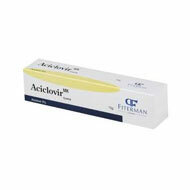 If you miss a dose of Aciclovir and are using it regularly, take it as soon as possible. If it is almost time for your next dose, skip the missed dose and go back to your regular dosing schedule. Do not take 2 doses at once. Store Aciclovir between 68 and 77 degrees F (20 and 25 degrees C). Brief storage at temperatures between 59 and 86 degrees F (15 and 30 degrees C) is permitted. Store away from heat, moisture, and light. Do not store in the bathroom. Keep Aciclovir out of the reach of children and away from pets.